This fete was an idea brewing in my mind for awhile…my girlies were having their dance friends over for a combined birthday party. Ok..did you hear that?? Yes, a combined birthday that they AGREED too! Yeehaw! While planning this shared celebration, i wanted it to reflect both of the honourees. Alexis is more of an outdoorsy girl and Melina? 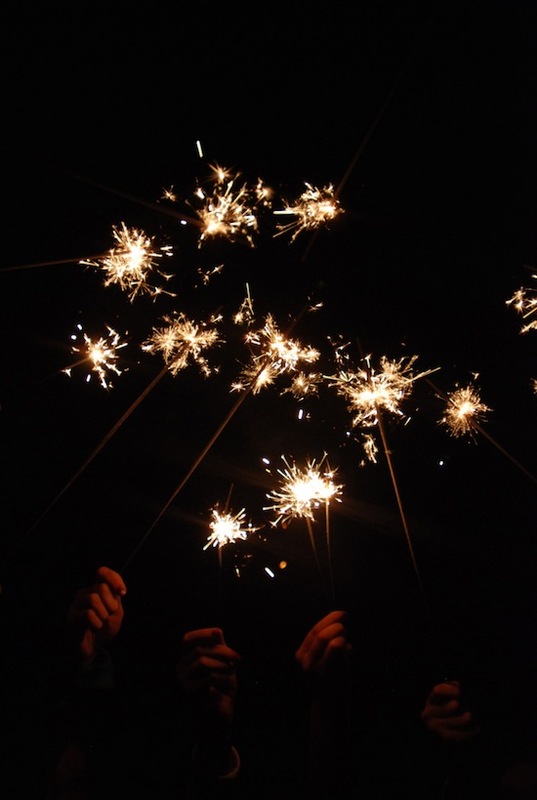 Well, she is bewitched by anything sparkly, glitzy and elegant. 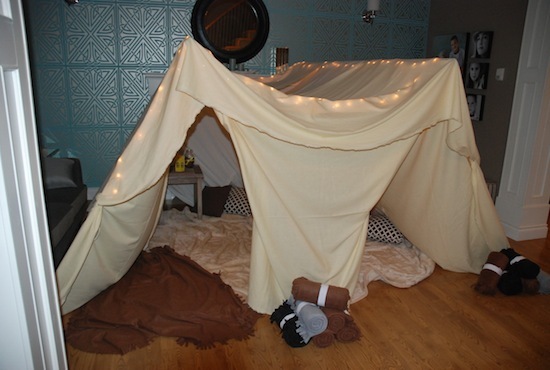 The solution: A Glamping party. 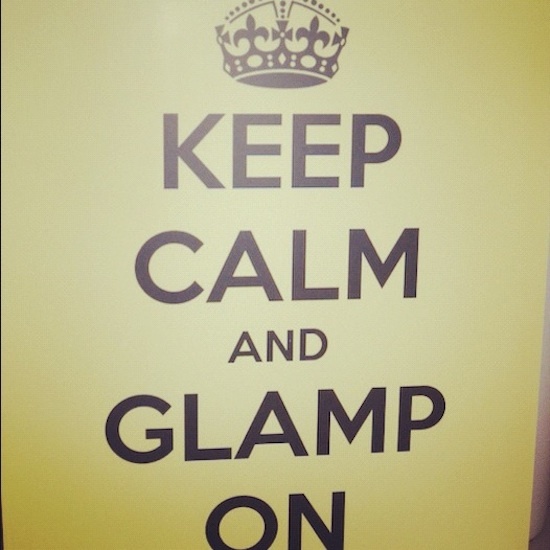 What is glamping, you ask? Glamourous camping! The best of both worlds, i’d say. We had fun planning their evening. 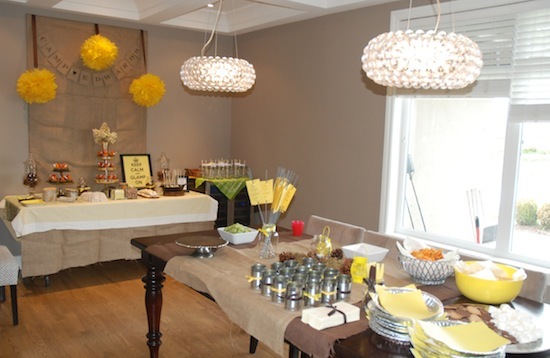 Inspired by one of my favourite sites, Hostess with the Mostess, and Elissa of One Stone Events, I had tons of ideas to jump off of! First on the list? 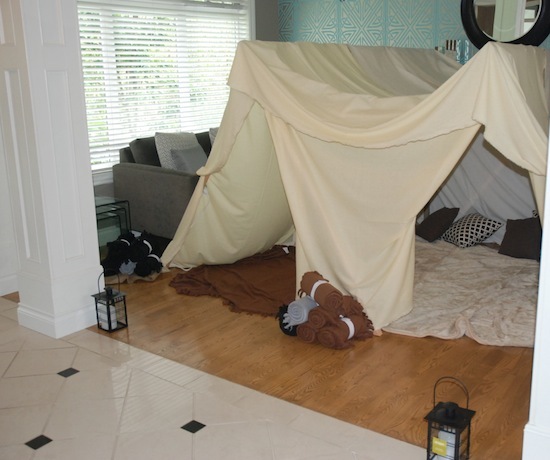 Transform our living room into a luxurious tent. This was, indeed, a family task! 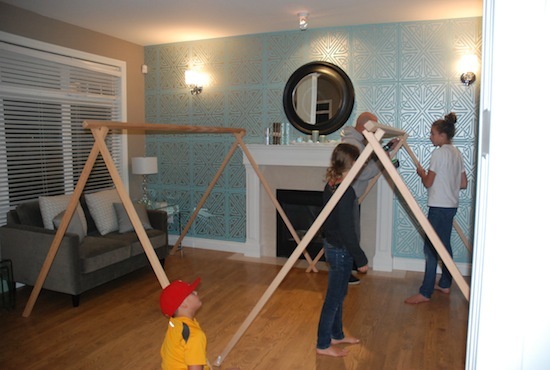 It’s amazing what a couple pieces of wood and a LOT of muslin will accomplish! Before….building the frames. And after! 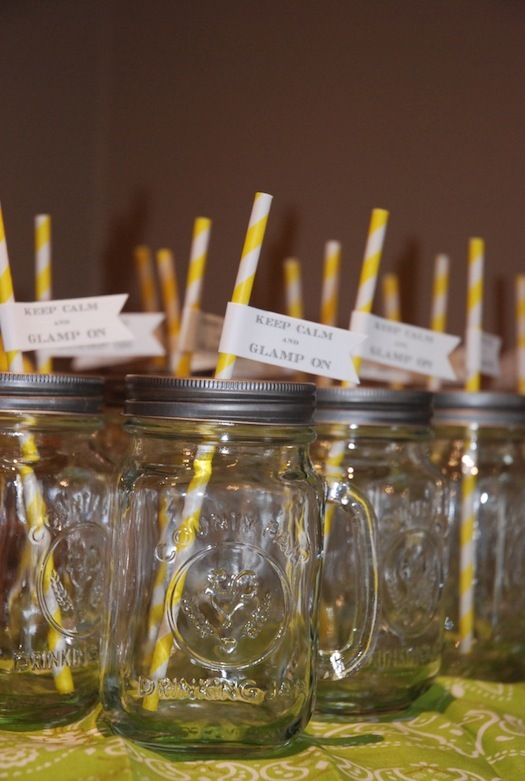 We included lights, blankets, lanterns..everything you would expect to have if you were a glampin’ girl! And each girl took a blanket home with them. You can never have too many soft, fuzzy blankets! 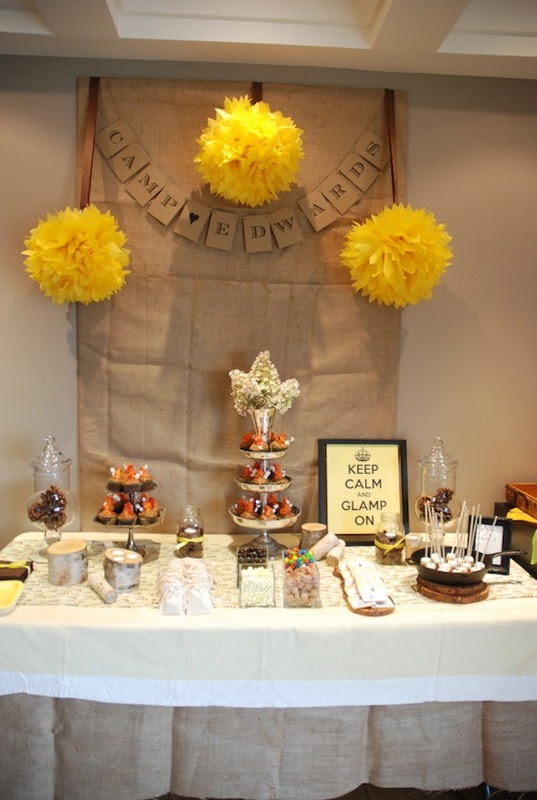 A burlap covered backboard set the scene with a little “Camp Edwards” banner and tissue balls! Cut wood pieces, some with hollowed out nooks for tea lights gave a rustic vibe. 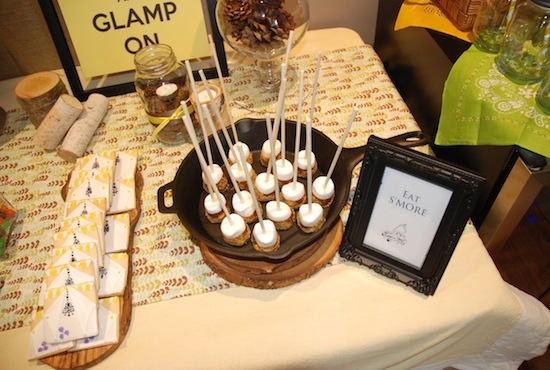 Eat S’more…marshmallow s’more pops. 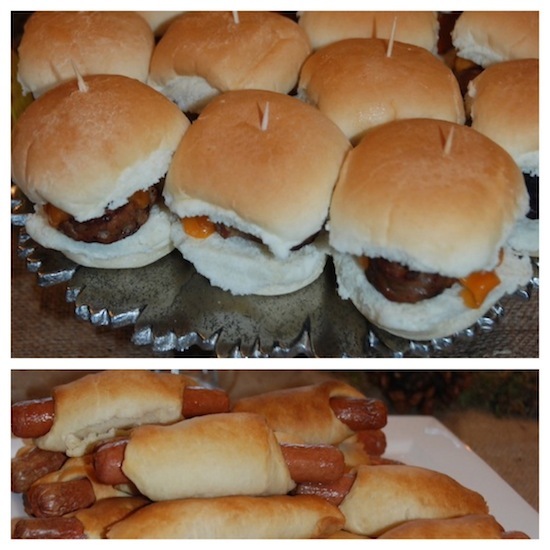 Incredibly easy to make! Skewer your marshy, dip in melted chocolate (melt choco chips and add a bit of oil to get a smooth, runny consistency), and sprinkle with graham crackers. S’mores on the go! Oh these cupcakes, i tell you!! 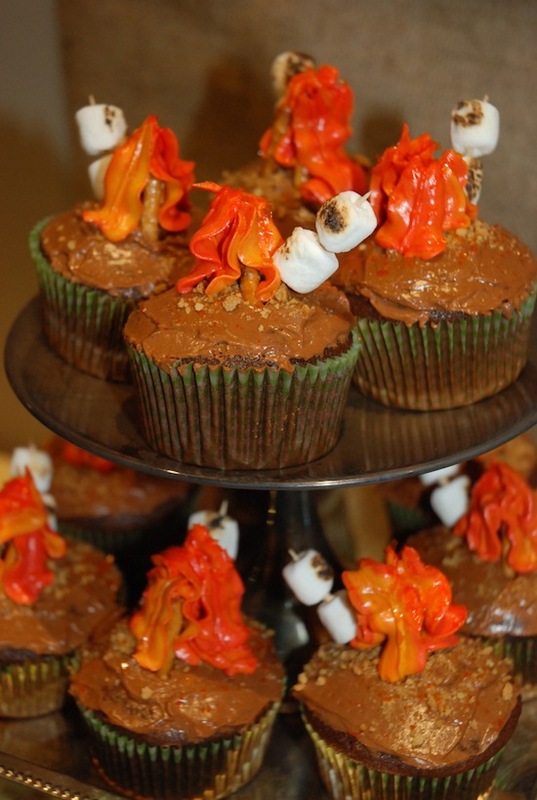 My friend, Andrea, whipped up these delights…chocolate cupcakes with little pretzel “campfires” and roasting marshmallows. How cute are they? And a cupcake rarity, they taste as good as they look!! 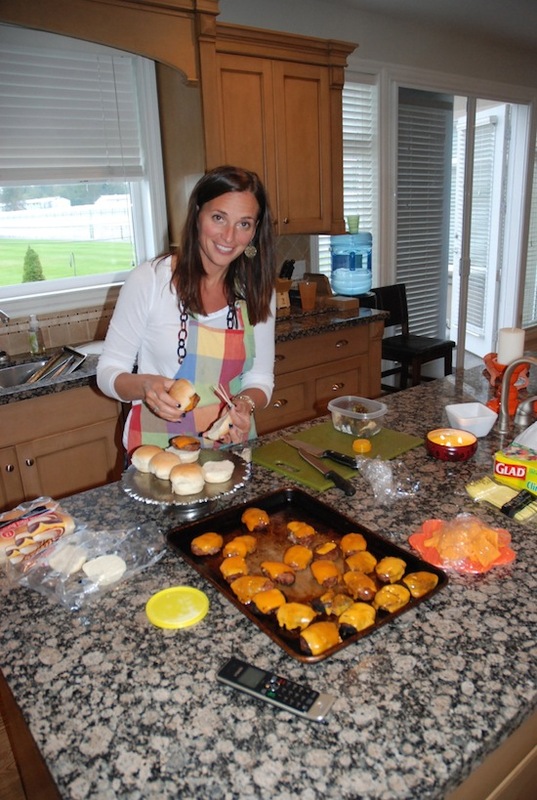 No one makes cupcakes like Andrea! 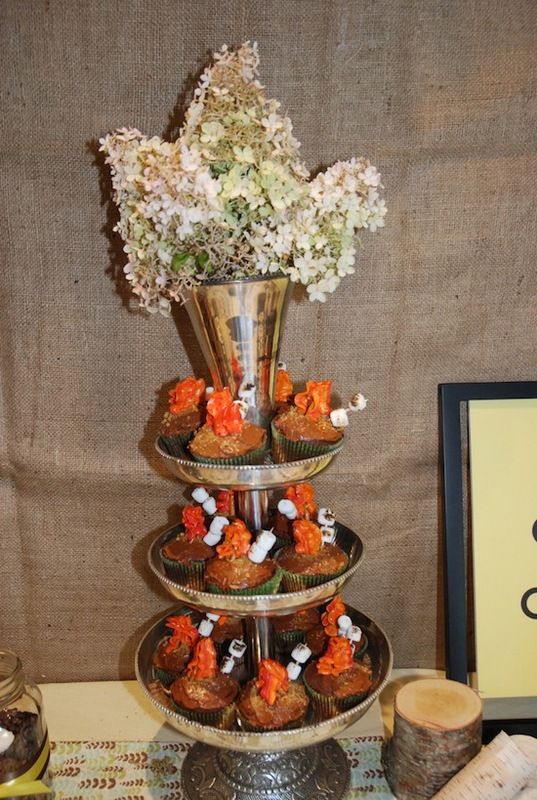 Fabulous sugar cookies decorated with tents and chandeliers were a HIT with the girls… Cookies by Pam makes amazingly yummy and pretty cookies! 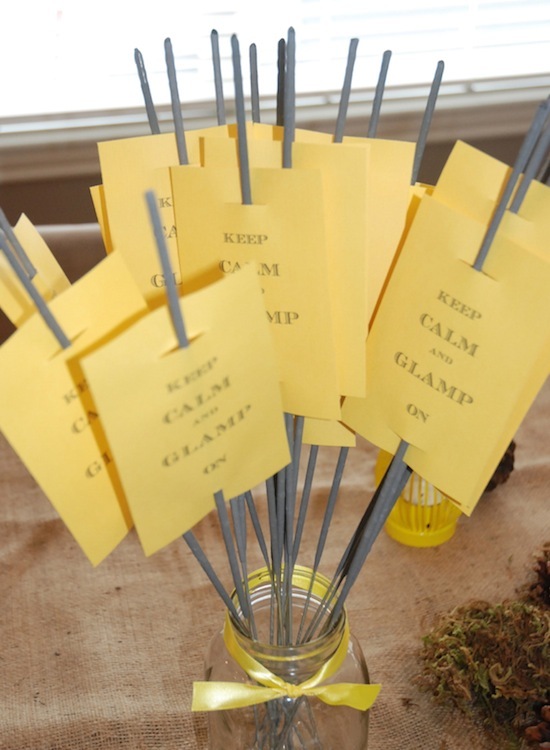 We added little details of our theme: “Keep Calm and Glamp On” throughout ..love these yellow and white paper straws with tags, from Lollipops and Pussycats, a darling shop on Etsy. Remember those mason jars i was talking about a couple of weeks ago? 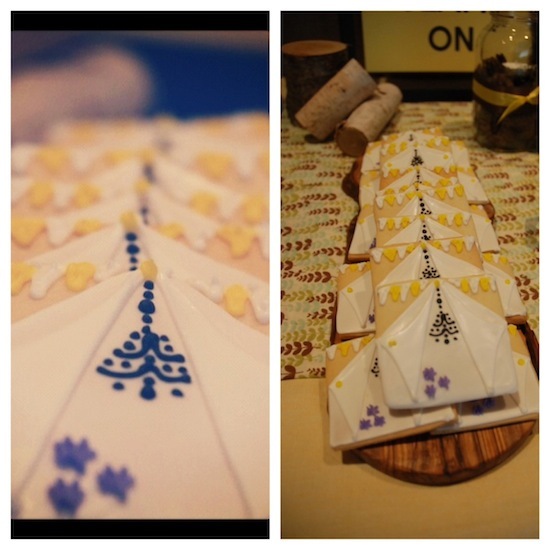 Here they are… we had little daisy stamped lids made for them. 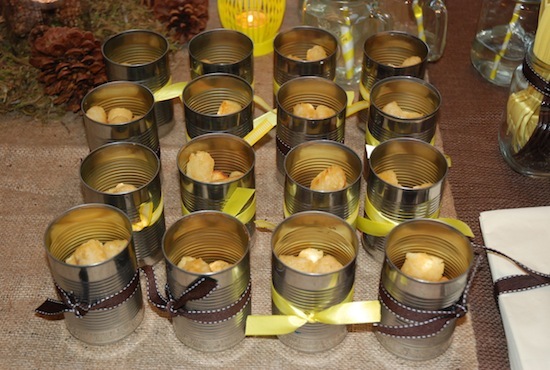 Tin cans acted as the holders for the tater tots. 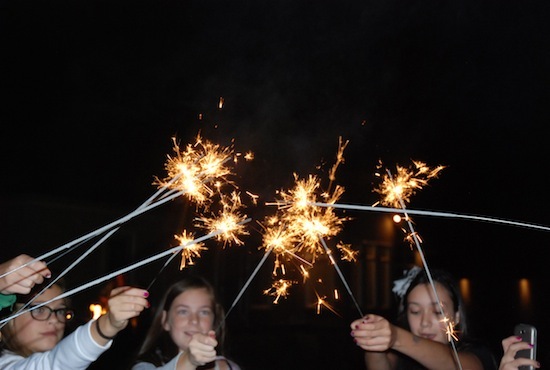 Keep Calm and light your sparklers!! 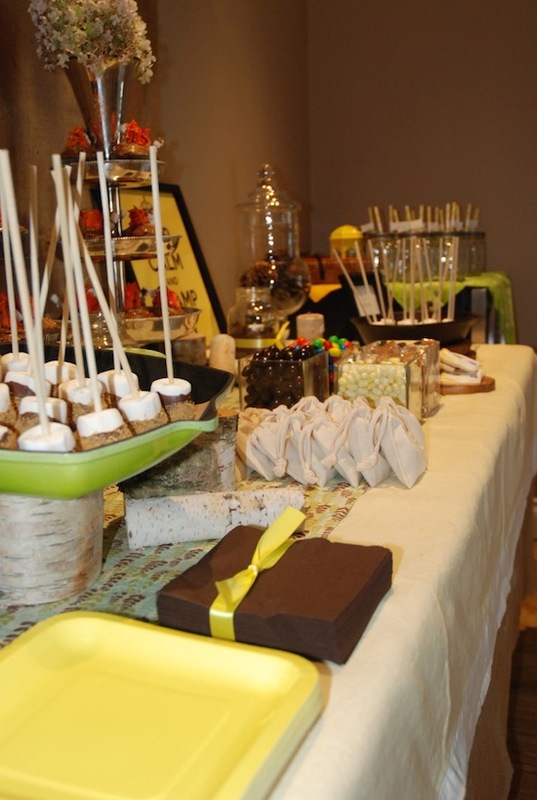 A treat for the end of the party!